Over the past few weeks, I kept trying to think of a weekend getaway plan that wouldn't cost too much or wouldn't involve too much travel (So that I can run back to Makati city in case any work crops up). 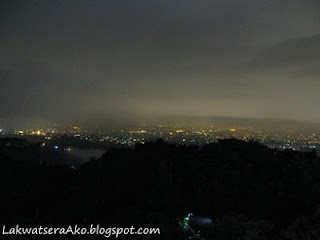 And a friend of mine brought up this place called Antipolo and I was like, "Why haven't I heard of this place before?" I decided to go over to this place to see what it's all about. It's just 25 kms away from Makati and I thought that I could always return if the place wasn't all that nice. I left at around 6pm in the evening on Saturday by taxi (I knew that there is a way there by bus/jeep but took a cab since it was getting late). The cab to Antipolo took me about one and a half hours and it cost me around 400 pesos. There's this resort called Cloud 9 which is on a small hillock... The ride up there doesn't take too long and it basically gives you a view of the entire city of Manila. And in the evening this is beautiful with all the lights. Please find some pictures below (I took these pictures from the internet, since I haven't transferred mine as yet). The weather was cooler since we were above the mean sea level. The rooms at the Cloud 9 range from 1800 pesos to 5000 pesos. I'm sure that one should be able to find more affordable rooms around the place since there are quite a number of hotels/resorts around. Since, it was pretty late already, we just chose to stay at this place. The service at the Cloud 9 resort was pretty pathetic but if you are looking to stay at this resort, here are the contact details. 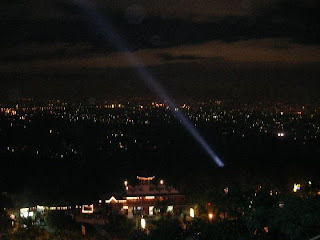 There are a number of 24 hour restos/bars around the resort which offer a magnificent view of the city at night. You feel that you are sitting on the clouds watching over the city. I stayed over for the night and left the next afternoon. Overall, I feel this is a trip well worth the expenses involved and it makes for a quick unplanned trip out of the city. In all this is a trip that can be a very affordable one and it sure will be one of my favourite locations to visit which doesn't involve too much cash and too much time.